From a Bourbon hogshead comes this 27 year old Isle of Jura from Bartels. Very sweet marzipan on the nose with hints of salty rubber. Fresh white fruits come rushing in after a couple of minutes in the glass, and some vanilla joins as well. Not at all what I expected in the taste. Again salty, but so many thing is going on that I almost get confused! Anise, licorice, oranges & lemons, oak, a touch of dried fruits and I could go on. It quiets down a bit in the finish, and leaves you with a nice and warm feeling. I think this whisky have some difficulties finding out where it wants to go. Too many different things is going on. 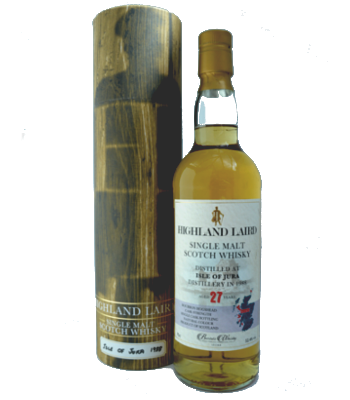 It is quite different from what you normally get from Jura, so if that is something you would like to try, this is for you. I will give this 82/100 (21/20/21/20).